Join us for the 2013 Gold Cup Race! The Connecticut Society will host the our 17th annual Virginia Gold Cup outing. Please join us on Saturday, May 4, 2013 at Great Meadows in the Plains, Virginia. 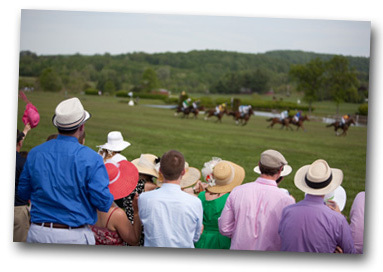 This all-day spring outing in the beautiful rolling Virginia countryside to view a traditional steeplechase is a very popular event and always a sell-out. Connecticut Society members can join us for $75 and non-members for $100. If you are not a member and would like to join, you can join us at the races and become a member of the Society for a special $90 rate. This low price covers transportation, all you can eat and drink, and the reservation of the rail-side tent. Online payment is preferred. The buses will leave Washington, D.C. on May 4 promptly at 10:00 a.m., and will depart Great Meadows after the last race. This event is rain or shine - but preferably shine!